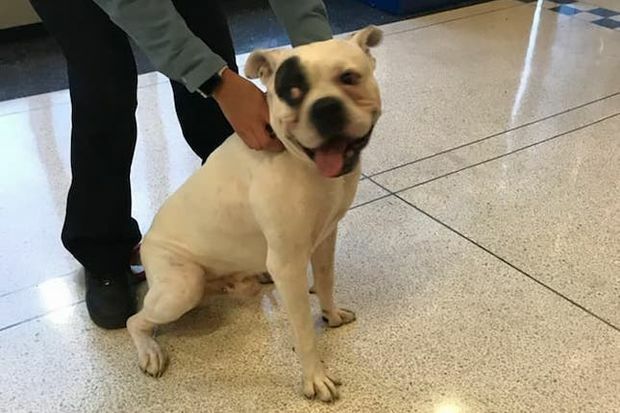 Police had to turn a stray pitbull over to animal control Wednesday because three other dogs were already being kept in the station, Chicago Police Lt. John Garrido said. CHICAGO — Anytime someone walks into the Jefferson Park Police District station, 5151 N. Milwaukee Ave., odds say they're sharing the building with at least one dog. "Some of the smaller dogs don't like to stay out in the garage, so we keep them with us right behind the counter," CAPS officer Annie Ruiz said. "We feel bad for them, and we're just trying to make them feel comfortable." At least one stray dog or cat is brought into the station every day, turning it into a de facto shelter for lost and found pets all over the Northwest Side, officers said. Sometimes it's more than one, according to Chicago Police Lt. John Garrido, who also runs a nonprofit foundation for stray pets. "Last Saturday we had six dogs come in. We almost ran out of places to put them," Garrido said. "A lot of people don't think to go to animal control, but we've educated the public that this is a safe place to bring them." Thanks in part to a microchip-reading machine and Garrido's own wide social media network, the police district has been able to return about 80 percent of dogs found in the last year to their owners, he said. The rest are turned over to shelters and adoption services, taking leashes and crates with them. That often leaves the station short of supplies, Ruiz said. "We give away leashes and collars for transport, and we hardly ever get them back," Ruiz said. "So we're always looking for leashes, collars, small crates, small bowls, plastic containers and dog food." The rush can sometimes be too much for police to handle on their own. That was the case Wednesday, when two stray pitbulls pushed the station's capacity, Garrido posted on Facebook. The Chicago Police Department is trying to equip every station in the city with a microchip reader so police can play a bigger role in getting pets home safely, Garrido said. "Citywide, there are hundreds of dogs and cats that get loose on a daily basis, and they end up in fire houses and police houses," Garrido said. "We're just trying to help alleviate the situation, because animal control is just inundated."